WASHINGTON — In conjunction with the April 2 release of 1940 Census records from the National Archives, the U.S. Census Bureau has launched a new page on its website. 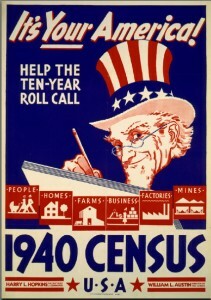 This poster was part of the publicity campaign for maximum public participation in the 1940 Census. Strict confidentiality laws ensure that census records are only unsealed after 72 years have passed, so genealogists, historians and researchers have waited with great eagerness for this release. Among other details, the records include information on the Japanese American population just prior to the mass exclusion and incarceration during World War II. In addition, there is a newly released infographic providing a rich visual depiction of how characteristics of the U.S. population have changed between 1940 and 2010. This is the first in a series of three infographics that will explore topics related to the 1940 Census. For more information, visit http://www.census.gov/1940census. This site will be updated regularly with new interactive features.